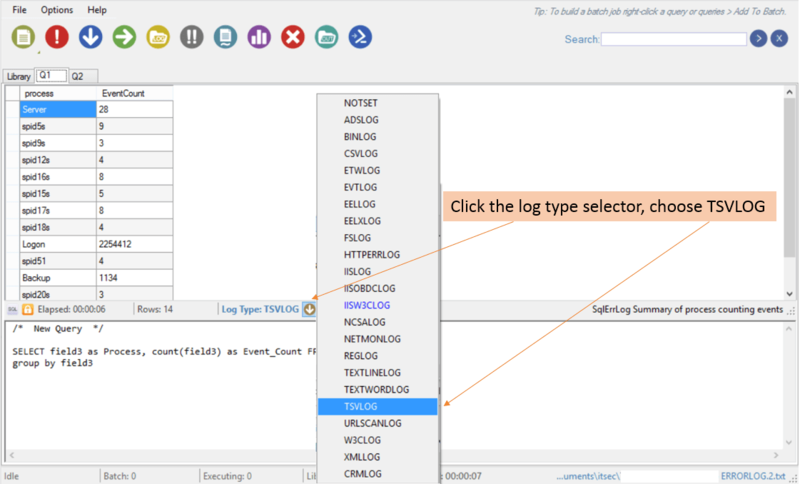 Microsoft Log Parser Studio (LPS) has become one of my favourite (free) tools whenever it comes time to work with log files of any significant size. In the past I have always used one of the pre-define log type formats when working with log files. Recently I needed to work with SQL Server error logs and was a little concerned initially that there was no pre-defined format for these logs and trying one of the standard log types didn’t give me the output I expected (or needed). With a little bit of effort I managed to figure out what was required, it turned out to be fairly simple. The trick was using the TSV format and then customising the settings. Microsoft System Centre Configuration Manager (SCCM) is used in an Active Directory environment to amongst other things deliver patches and antivirus to the servers and workstations. In a large environment you can have quite a number of SCCM servers operating in tandem to deliver the data to the client devices. Obtaining details in an SCCM environment of exactly which endpoints are being served by which servers (or how busy each server is) isn’t quite as straightforward as one might imagine. The client devices all connect to the servers through HTTP calls to collect the packages they require. The IIS logs from the SCCM servers can be downloaded and analysed to try to figure out what is happening in the environment. Further fields such as Cookie, Referer events and process types are present but I found these to be generally blank. The above example includes the data transferred (sc-bytes and cs-bytes) which were not turned on by default and which I found quite useful. These can be activated in IIS easily enough. In my use case I obtained the logs from 83 servers which amounted to 2859 files over 254 folders coming to 122GB (uncompressed). The proves to be a little bit of a challenge when I don’t have SQL server installed on my PC or Laptop, MS Access is limited to 2GB database and even SQL Express 2014 is limited to 10GB. I had previously heard of (but not used) Microsoft Log Parser. A quick search revealed version 2.2 (released some 9 years ago in 2005 – but don’t let that put you off) available for download. Now this is a pretty nifty tool as it understands log files in many different formats (and even plain text files). This saves you from having to clean up the log files to strip out headers (which are written to the logs every time the web server starts / restarts) and from having to combine many different files. A real time-saver. You can then write SQL-like queries and have them executed against your log files to get your results. Now with data of the size above on my 8 Gig i7 870 @ 2.93GHZ running off a Seagate 2TB 7200rpm SATA drive it takes around 3.5 hours to run a query (know how to speed this up fundamentally do share). Using Task Manager to monitor the execution of the query shows CPU utilisation of only around 8% (one thread sits at about a 50% utilisation) memory utilisation of between 50MB upwards (as the result set grows) and disk speed varying from about 8MB/s to 30MB/s. So not quite sure where the bottleneck lies. Writing the queries at the command line is a little bit of a pain so the next bit of genius is the Log Parser Studio. Unlike Log Parser, the studio is kept up to date, with the latest build being 2.0.0.100 from 23 May 2014. The studio provides a library of queries (over 170) covering logs from ActiveSync, IIS, Windows event logs, Exchange, Outlook Web access amongst others. Covers a huge number of ideas for useful analysis and provides the queries to do it for you. What is great is that you can use these, modify them for your own purposes or create your own from scratch, and add them all to your own personal library. For example, to understand what the patterns of access look like over a month a query such as this can be pretty useful. A challenge that you quickly come across is that both the Log Parser and the Studio (which is dependent on the Parser) are 32 bit applications so you need to be careful as to which fields and how much summarisation is included in the result set. If the results grow to quickly then the query will crash as it runs out of memory. The trick is to find a balance between too much information (it crashes) and too little information (need to run many queries). Finding the right balance means further analysis can be done in Excel or Access. I have found that 30 000+ rows still works if few enough fields are chosen and some smart queries are used. So whereas I would have expected sum(time-taken/60) to give me a result in minutes it fails with an unknown field. Even (sum((time-taken)/60) fails. Check the function reference shows that log parser wants it as sum(div(time-taken,60)) and then life is happy again. Running your query again having just spent 3 hours waiting for the last one to complete – a little less so. Using these tools and queries I was then able to summarise down the 160 gig of source data into a few thousand rows that could be imported into Access and joined to CMDB data to produce really useful intelligence that can be analysed directly in Access, Excel or Gephi. Thanks Microsoft for these great free products. I was also looking for further pre-built queries for Log Parser Studio but was unable to find any. If you know where such may be found, please do share. If there is interest and as I use the tool more I will be happy to share anything I have created.